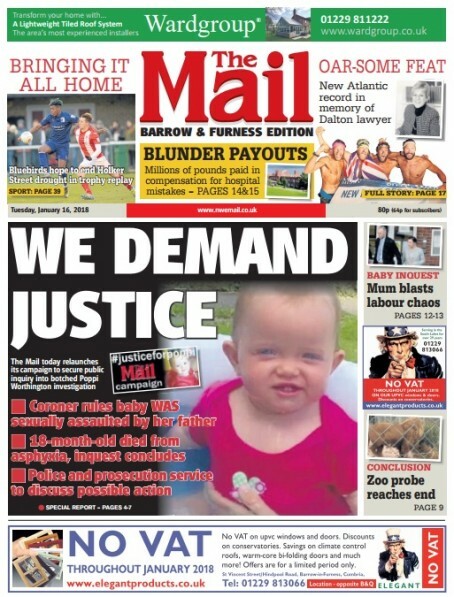 A regional daily will press on with its bid to get justice for a dead baby after prosecutors ruled there would be no further review into the case. The Mail, which is based in Barrow, wants an independent inquiry into the death of Poppi Worthington, an issue on which it has campaigned since 2016. Earlier this year a coroner ruled that baby Poppi was sexually assaulted by her father Paul Worthington before her death, but now the Crown Prosecution Service (CPS) said no new evidence “capable of affecting decisions not to prosecute” had emerged at the inquest. Mr Worthington, who denies any wrongdoing, had been arrested in August 2013 and questioned on suspicion of sexual assault but was not charged with any offence. Mail editor James Higgins told HTFP: “Realistically, the CPS were never going to come back with a decision to pursue a prosecution. We have been down the path of a re-examination of the evidence before, and the tragic reality is that, despite two judges having said Poppi’s dad sexually assaulted her on the night she died, the police investigation was fatally flawed. “The evidence which may have secured a prosecution was literally thrown out with the rubbish, while due process was not followed. “What we must now focus our efforts on is our call for a full and independent public inquiry into the failings – which go well beyond those perpetrated by Cumbria Constabulary.